Clyde Aikau permeates surfing lore on all levels: Hawaiian surf royal, pro competitor, and Waimea big wave waterman. He spent years pulling surfers and tourists from Poseidon’s deadly clutches as a Waimea lifeguard. The Hawaiian regular footer was named a “Waikiki Surfing Legend” by the Duke Kahanamoku Foundation. Like his brother Eddie, he served as crew member on the Hokulea, a replica of the original Polynesian sailing canoe that made the journey from Tahiti to Hawaii. He won (and placed highly) in some of pro surfing’s most historic events and was even ranked as high as 12th on the World Championship Tour in 1976. 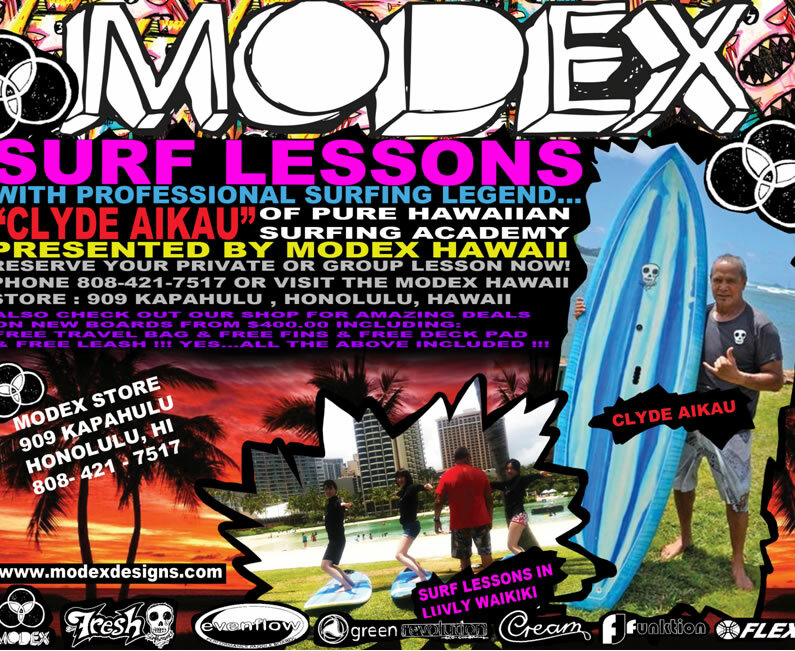 And, of course, Clyde Aikau is member of one of Hawaii’s most legendary surfing families. In a few short years after diving head first into wave riding, Clyde Aikau was winning major pro events. He won the Makaha International Surfing Championship and soon in 1973, he bested a new breed of international professionals at the Duke Surfing Championship. Aikau took a 3rd place at the Stubbies Surf Classic in 1977 as well as a 7th place at the Pro Class Trials in 1976. Although a career in professional surfing was not a feasible endeavor in those days, there is one win that would solidify Clyde Aikau’s presence in surfing history forever. He won the inaugural Quicksilver Eddie Aikau Big Wave Contest in macking 25 foot surf in 1986 (named after his brother who was lost at sea during a voyage on the Hokulea). He told Dailystoke.com about an inspiring sign that helped him win the event. He explained, “Those turtles to me were a symbol of Eddie and Jose Angel. It's happened twice that day. Everyone was in the regular lineup when these two turtles appeared and I followed them out beyond everyone else and deeper than everyone else. Then this huge wave came and I jumped on it. It happened twice in that heat.” Aikau was named a “Waikiki surfing legend” by the Duke Kahanamoku foundation. Still living on his beloved North Shore and still surfing big waves and mixing it up with the world’s best, Clyde Aikau now has a family and owns a surf school , the Aikau Pure Hawaiian Surf Academy, but his legacy lies among the those giant swells that come marching into Waimea Bay each season, the lifeguard stand planted just a dozen yards from the shoreline, and amidst his memories of a life with his best friend and brother Eddie.